Transport yourself to a tropical rainforest in the comfortable humidity of the Journey to South America gallery, full of free-flying birds, exotic fish and reptiles, and a 17-foot waterfall. Range: The Arapaima can be found exclusively in the Amazon River Basin of South America. 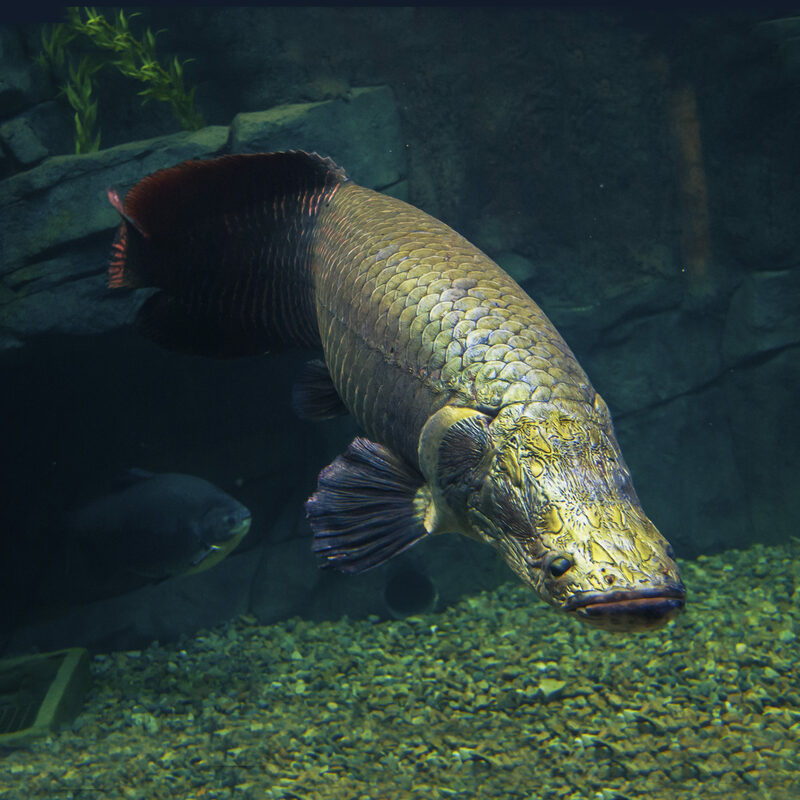 Habitat: There are several types of habitats where the Arapaima can be found including floodplain lakes; large tributaries of the Amazon River, including the Rio Madera and the Rio Machado; and the Várzea forest. Size: As one of the largest freshwater fish in the world, the Arapaima can reach up to 15 feet long and weigh up to 441 pounds. Diet: The diet of the Arapaima is mostly fish and small animals in adulthood and insects and small fish when they are younger. Conservation Connection: The population is threatened due to overfishing by humans. Did You Know? Even though Arapaima have gills, they need extra air from the surface in order to breathe. Range: Dwarf caimans can be found by the Amazon and Orinoco Rivers. Habitat: They live in fast moving, cool streams in forested areas but can also be found near rapids and waterfalls. Size: Female Dwarf caimans will grow to about 1.4 meters while males can grow up to 2.3 meters. Diet: Adult Dwarf caimans feed on fish, crab, mollusks, shrimp, and terrestrial vertebrates. Juveniles eat small invertebrates. 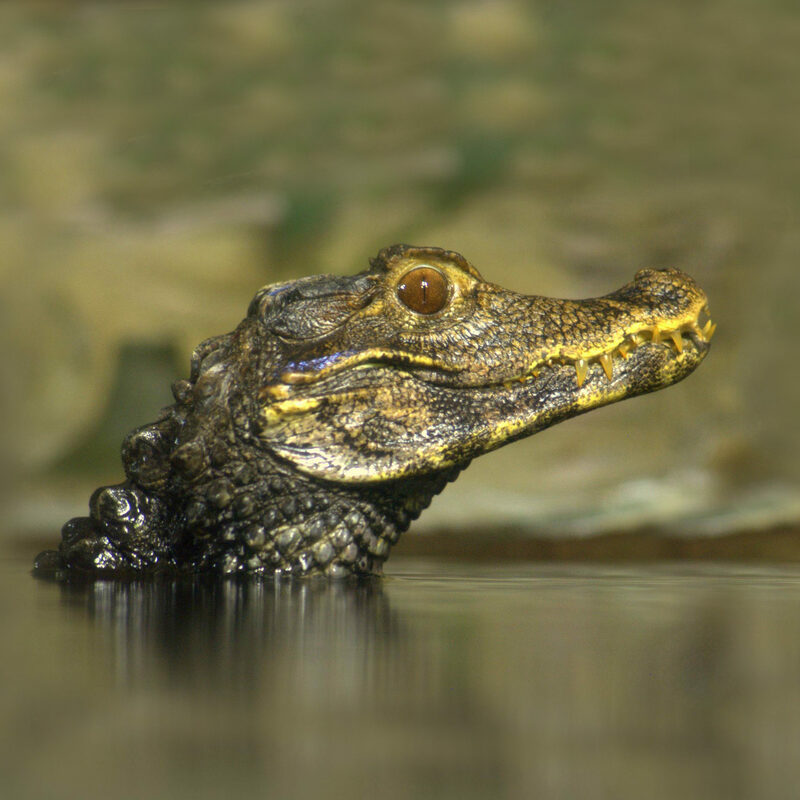 Conservation Connection: The biggest threat to caimans is the pollution of their habitats and habitat destruction from gold mining. Did You Know? The skin of a caiman is too bony to use as leather and are therefore not hunted by humans for that purpose, unlike the skin of crocodiles. Range: The Green anaconda can be found in tropical South America east of the Andes. They are mostly seen in the Amazon and Orinoco Basins but can also be found in the Guianas. Habitat: Since the Green anaconda is semi-aquatic, they live in thickly-vegetated swamps and flooded forests. They live in the murky, still water and hunt on the land. Size: The green anaconda can grow up to 19.5 feet long and weigh up to 500 pounds. Diet: The diet of a Green anaconda is mostly made up of fish, birds, reptiles, and small mammals. Conservation Connection: There are no natural predators so their greatest threats are hunting and habit degradation. 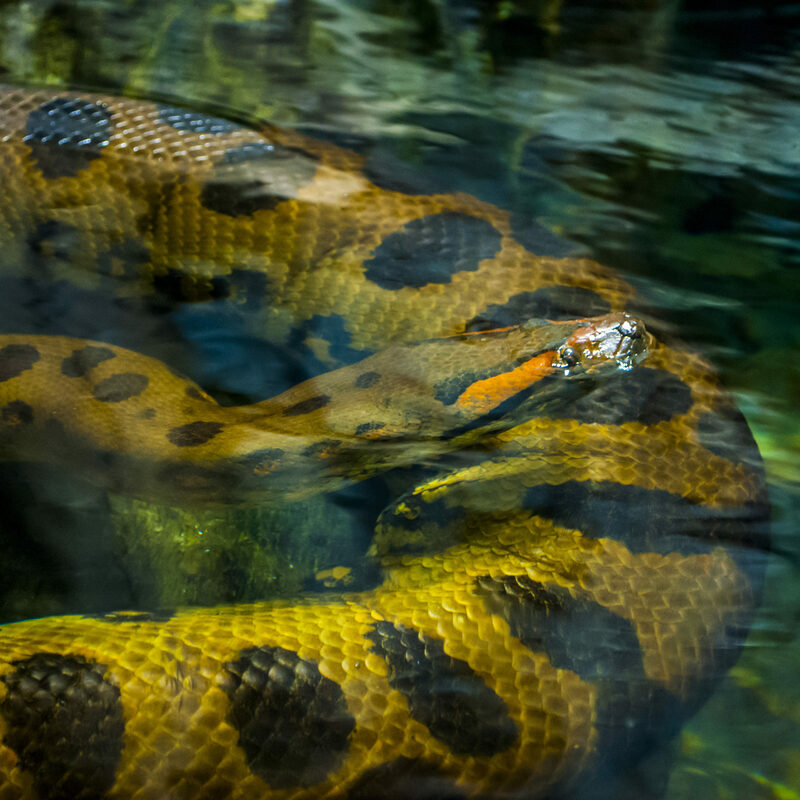 There are restrictions in South America that make the trade of anacondas illegal. Did You Know? In 1910, President Roosevelt offered a reward of $1,000 for a live snake measuring over 30 feet. Over the years the reward was raised to $50,000, and still to this day remains uncollected. Range: The Green aracari can be found in the lowland forests of northern South America as well as Columbia, Venezuela, Guyana, and Surinam. Habitat: These birds live in tropical rainforests within their range. Size: The Green aracari weighs about 150 grams and will grow to about 30 centimeters. Their wingspan will reach about 30 centimeters. 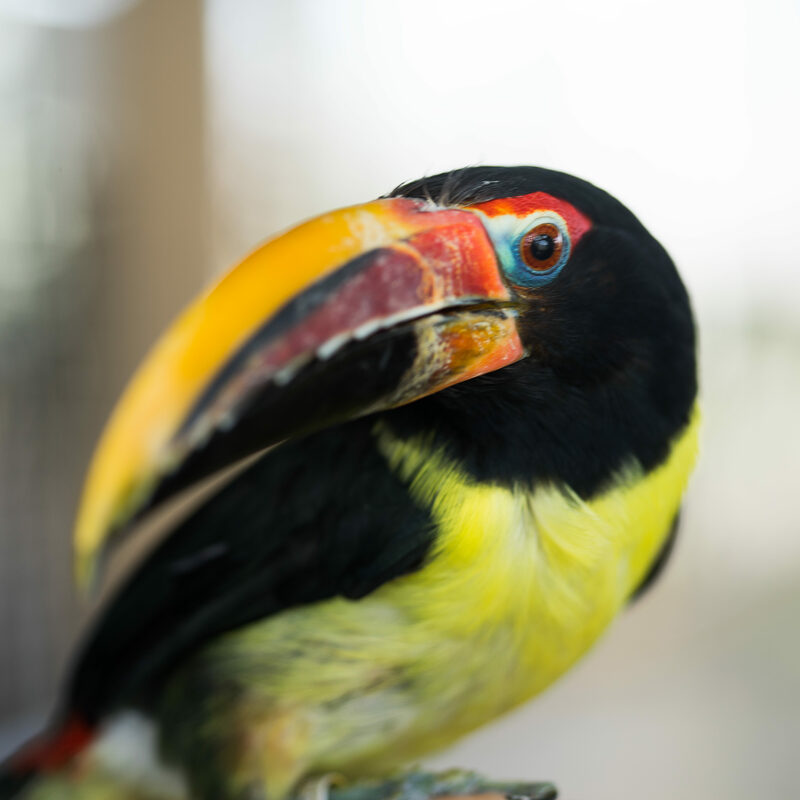 Diet: The diet of a Green aracari consists of mainly fruit, especially figs and palms. Conservation Connection: Green aracaris are not currently endangered but they have a declining population due to habitat degradation. Did You Know? Green aracaris are the only member of the toucan family that uses their nest to sleep outside of the breeding period.